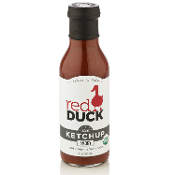 Red Duck left out the high fructose corn syrup, stabilizers, and preservatives and stuck to high-quality organic ingredients. They wanted delicious ketchup without scary chemicals. Red Duck Smokey flavor (previously known as "Classic") is a twist on traditional ketchup that marries a hint of sweet balsamic vinegar with a trace of smoky spices. "We drew our inspiration for this recipe from the delectable heirloom tomato salads we enjoy every summer - delicious balsamic reductions, tomatoes, and the smoke of the grill in the background. Our classic flavor is perfect on french fries, burgers, hot dogs, and meat loaf. But with this guy, the sky is the limit." You’ve never had ketchup like this before. "With this flavor, you’ll notice a peppery spice that’s calmed by the warm flavors that Indian food so masterfully blends. Put it on fish, stir-fry, roasted vegetables, or even mix it with plain rice. Trust us, it’s that good!" "This puppy has a kick. We take our proprietary Latin-infused spice blend (we call it the Latino Charmer) and combine it with a few other secret ingredients to complement some of the incredible Mexican flavors that Kurt grew up with near the border in San Diego. This is our most popular flavor, and we know you’ll soon be clamoring for another jar. We love to put our spicy flavor on sweet potato fries, fried chicken, veggie burgers, and even drizzled on top of cheese pizza. But we bet you have some great ideas too." Try one, two or all three flavors! Available in 2oz jars or the NEW 14oz bottles.